These elongated patches of emission nebulae are designated LBN 278, LBN 301, LBN 310, LBN 313, LBN 325, LBN 326 and LBN 335 in Lynd's Bright Nebulae (LBN) catalog. They are large and extremely faint emission nebulae located in Cygnus, 4.5 degrees straight west of Deneb, the constellation's brightest star. They belong to a huge nebulae complex which also includes the γ Cygni Nebula Region and the NGC 6914 and vdB132 Region to the south. 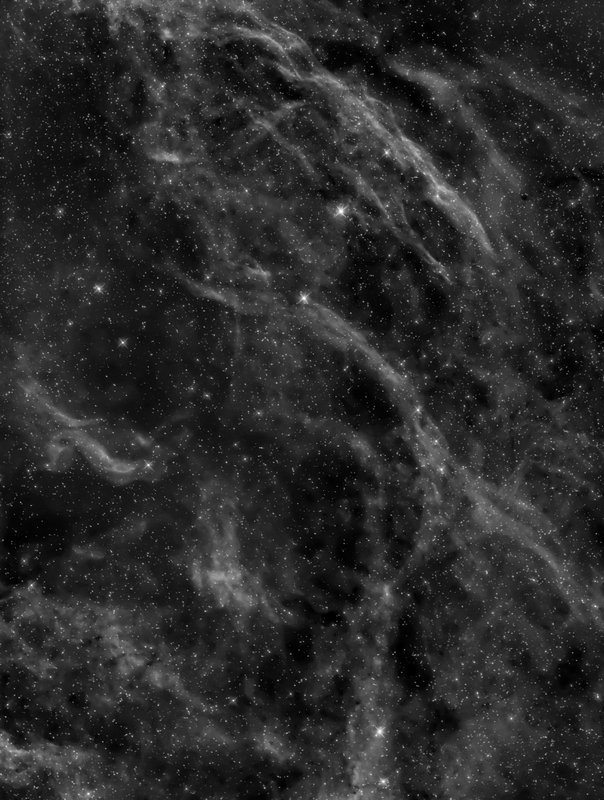 The curved appearance and filamentary structure of these nebulae imply that they were formed by a supernova which may have exploded somewhere to the east (left) of this picture. The nebulosity emits all of its light in isolated emission lines. The most prominent of those is the Hα line, which was exclusively recorded to obtain the image shown above, displayed here in gray tones. At a wavelength of 656 nm, it is located at the red end of the visual spectral range, and cannot be not very well perceived by the human eye during nighttime. LBN 310 and Surrounding Nebulosity in narrow-band filters, natural colors, which this image is part of.